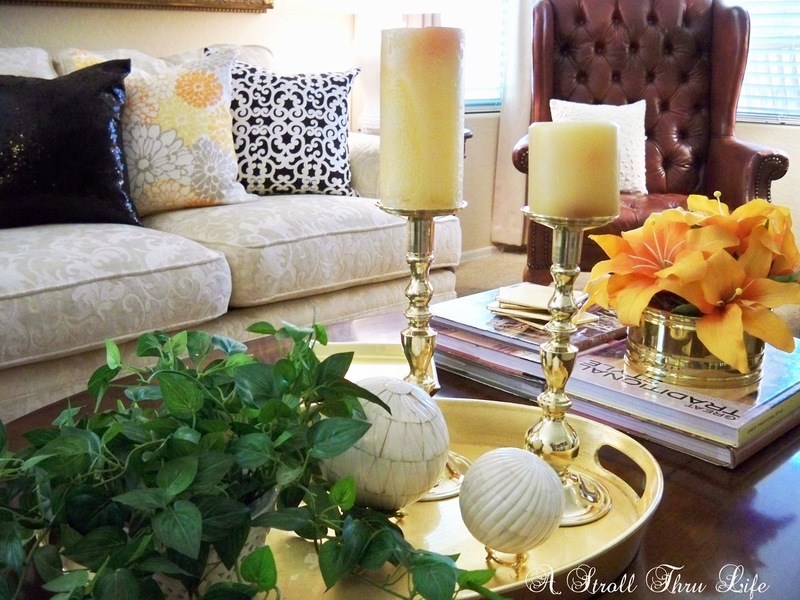 I've been busy playing with a few new vignettes in the living room, It's always fun to play, don't you think? 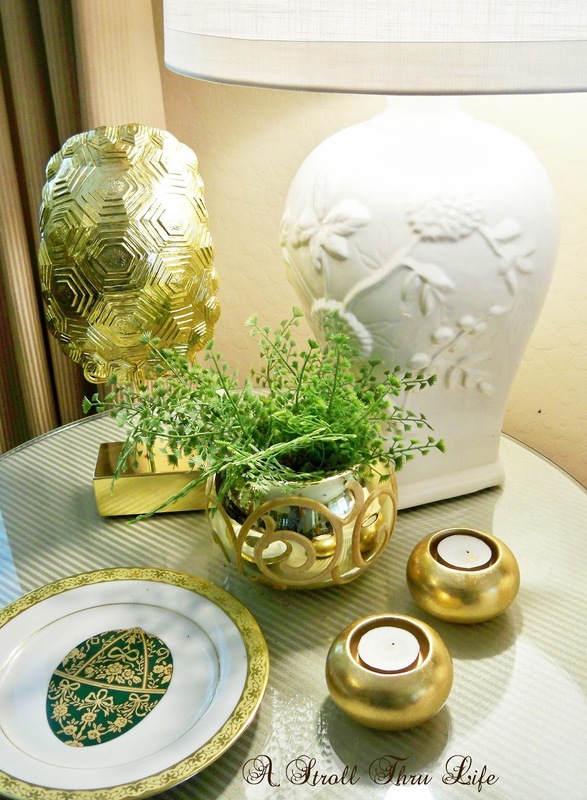 I've always loved brass and have a few pieces in my stash, plus I found some fabulous new pieces at goodwill. You can see everything I found here, I hit the mother lode. Time to pull it all out and enjoy the sparkle. Brass and Flowers, always pretty. 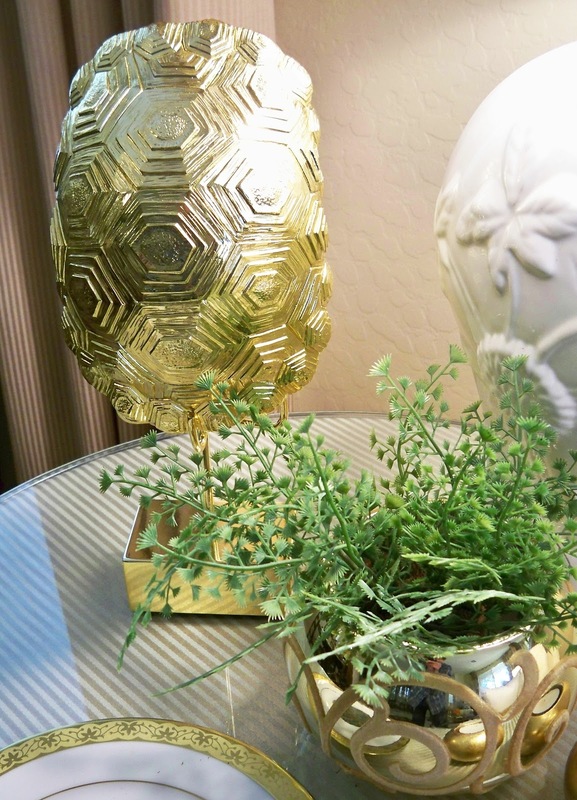 Lots of bling on this end table too. 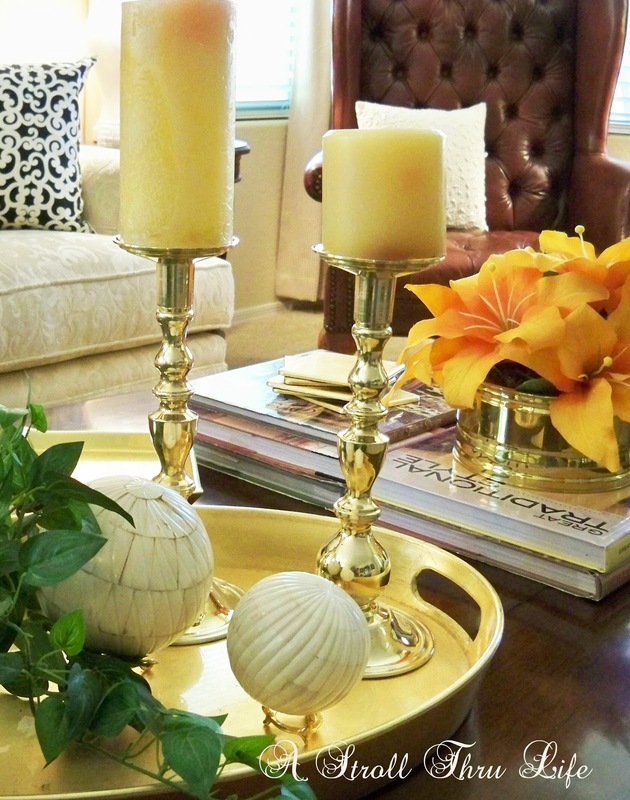 Gold tortoise shell from West Elm and gold votives and planter from goodwill. So, how about you, are you adding some shine and sparkle to your decor too? Since so many are having a problem receiving their subscriptions to blogs they want to follow by email, Susan at Between Naps On The Porch did a fabulous post that might solve the problem. Give it a try. You can also follow with Bloglovin, it will come in your email box too. Just click on the heart at the top of my blog. Oh Marty, the brass looks really good and I am so happy that it is back in style again. However, I gave mine all away. Will have to make a few trips to GW & SA to see if they have any. Love the pretty pillows and coral color you have in the flowers, pillow and candles. Makes it look so summery. Great choices. I love brass I could never understand why it went out of style. I think it is a very classic look and really timeless. I love all the bling you have going on. I may have to add some brass to my rooms. My local thrift store has a ton of it at really good prices so I might have to pick a few pieces up. Marty you always have a way of pulling things together for great vignettes. 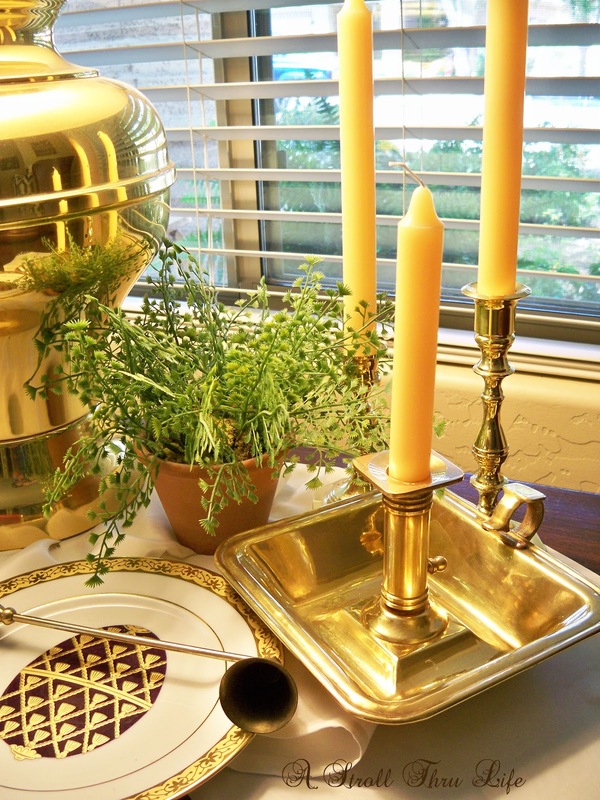 Love the brass candlesticks. I can never find good candle sticks at our local goodwills.........nor really at Garage sales. It all looks great, Marty! I love how nice it looks put together in groupings, too. Love it all Marty! You really know how to pull it all together! The pillows are fab too! Love the tangerine colors! So summer, and I heard brass is back in! Better dig mine out! Everything looks gorgeous! I've missed checking in on you and many other bloggers ~ have had sooo many technical issues the past couple months. So happy that brass is making a comeback. Your styling is beautiful! You have some wonderful pieces of brass! Your vignettes are wonderful, and they are such a simple way to redecorate and make you feel like you have a whole new room. Good job!! The gold tortoise shell is beautiful! I love your vignettes and your decorating is SPOT on, Marty! Awesome job in choosing your unique pieces! Oh so pretty! I love your beautiful decor. You have talent with vignettes. You really did strike gold ;) at the thrift store. So pretty with the flowers. Have a great weekend. Everything is beautiful, Marty. You always do a wonderful job. You love brass like I love silver. I remember when I had so much brass..and orange things in my home..and I still think they are beautiful. We all moved on but it always seems to go back to what we had years ago that we wish we had kept. Your home is always, ALWAYS, stunning! I have saved posts of yours..so informative. For example..how to hang drapes. I learn a lot from you. You always stay up to date so beautifully. Marty, everything is so pretty! I know I say this all the time, but we never have anything good at our Goodwills! They have expensive junk! You always amaze me with your treasures! 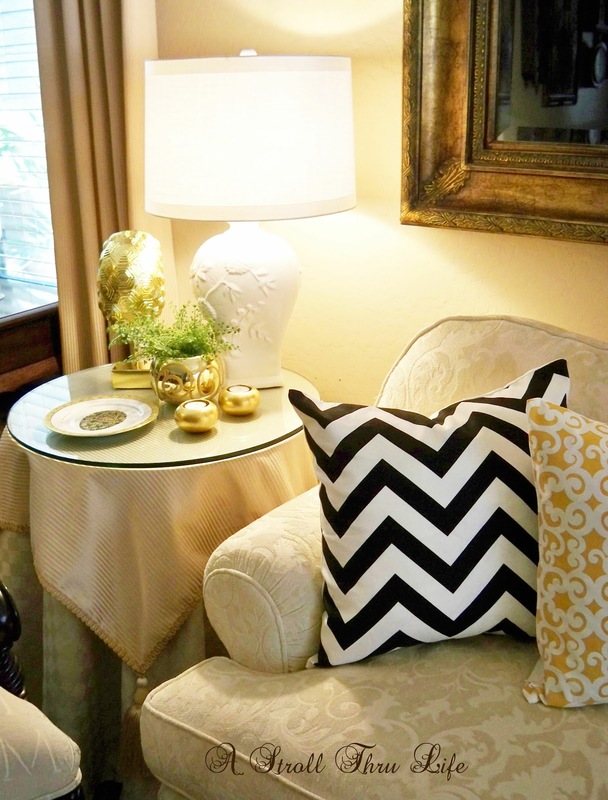 Your additions of the brass and gold items are stunning in this room! I'm off to Susan's to read her fix for this problem. I have lost all of my blog feeds! Marty, you have such a knack for putting together beautiful vignettes! Whenever I'm struggling to put one of mine together I come here for inspiration :) You always find such expensive looking treasures at thrift stores - I would love to spend a day thrifting with you! 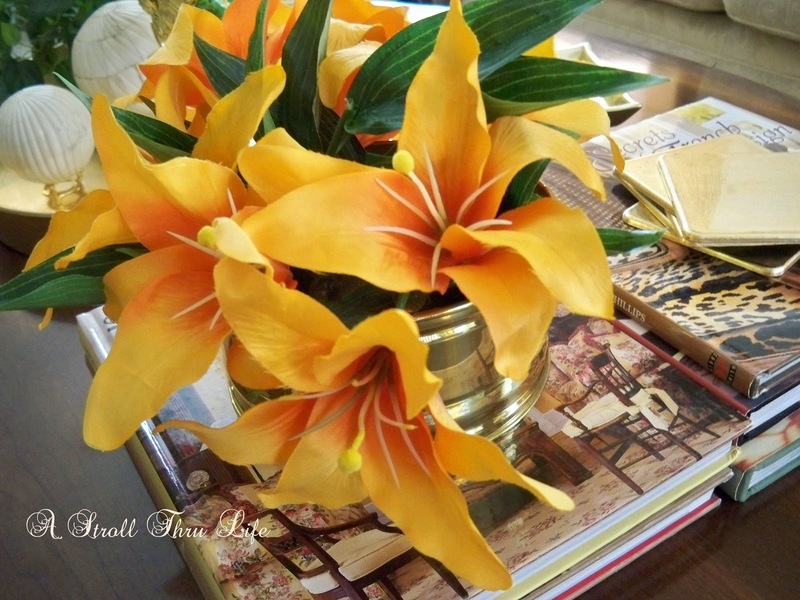 The hits of coral are so pretty in your living room - I love the floral pillow. Everything you touch is golden, Marty! You have such a wonderful way with working vignettes. 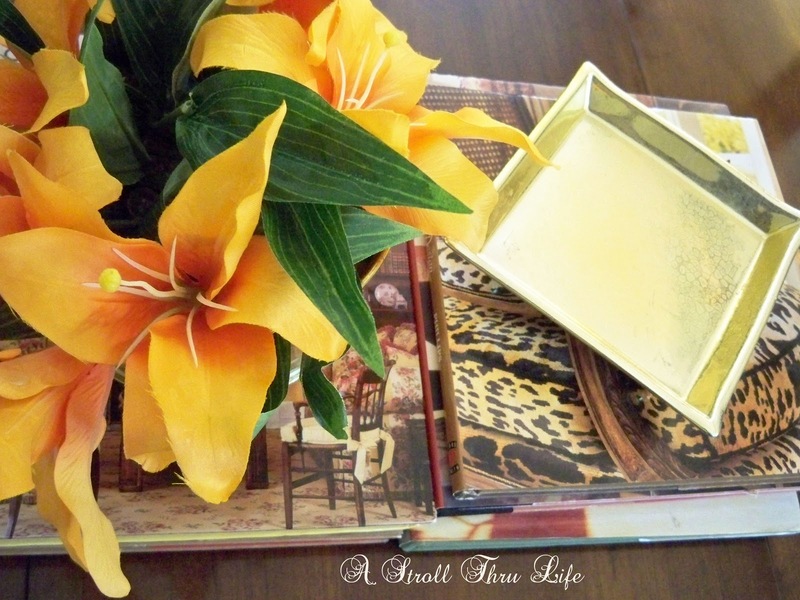 Thanks for sharing with us at my Creative Ways Link Party! I am really loving these new changes Marty! Such fun details to make your home your own!